George Edward Symonds (born in St Peter-le-Bailey parish, Oxford on 28 January 1820 and baptised at St Mary Magdalen Church on 22 March 1837 at the age of 17). On 25 April 1805 Frederick’s father was matriculated at the University of Oxford as a privileged person with the trade of a pharmacopola (chemist). 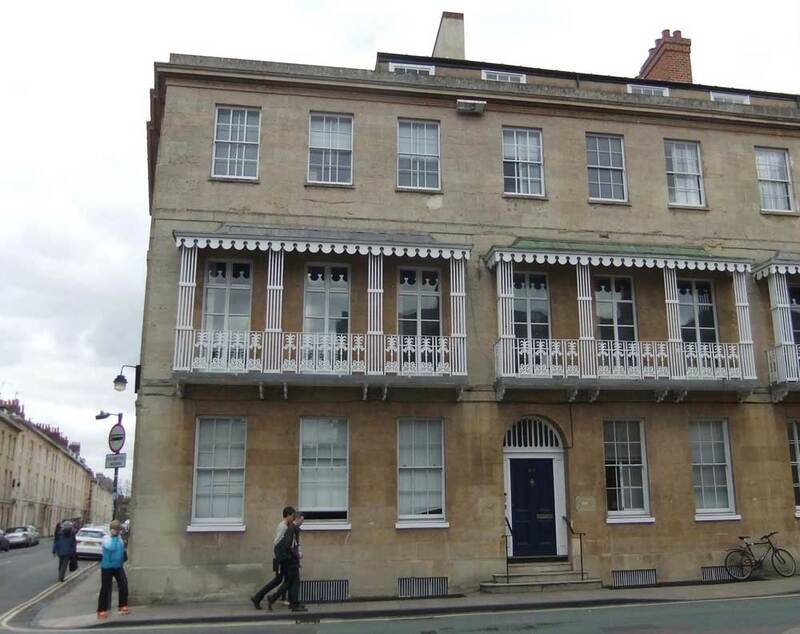 He and his family were evidently living in St Peter-le-Bailey parish between 1812 and 1820, but by 1830 they had moved to a newly-built mansion in Beaumont Street. Left: The house in Beaumont Street where John Symonds, his son Frederick, and his grandson Horatio had their medical practice for at least seventy years. The number of this house took some time to settle: it is given as 32 in the 1840s, and as 33 in the 1860s, finally becoming 35, the number it is today, in about 1870. There is no 34 Beaumont Street, and so sometimes this house is numbered 34 & 35. On 16 April 1831 Frederick’s elder brother John Addington Symonds senior (born in Oxford in 1808) was matriculated at the University of Oxford as a privileged person with the trade of chirurgus et pharmacopola (surgeon and apothecary). In that year, John moved to Bristol on the advice of his great-uncle Dr Addington who practised there and became the most eminent surgeon in the west of England: see his entry (and that of his son John Addington Symonds junior) in the Oxford Dictionary of National Biography. Frederick’s younger brother Alfred Radford Symonds was admitted to St Mary Magdalen Church at the age of 18 on 25 August 1833 “having been previously baptised”, and another brother George Edward Symonds was baptised there for the first time at the age of 17 on 22 March 1837: doubtless this was in preparation for their admission to the University of Oxford, and Alfred was matriculated from St Edmund Hall in 1833; Henry by Magdalen Hall in 1836; and George by Lincoln College in 1838, and all three became clergymen. In addition Frederick’s three sisters must also have turned away from Methodism, as they were all married to Church of England clergymen at St Mary Magdalen Church: Mary Susan Symonds to James Nash on 26 June 1832; Charlotte Symonds to Clement Dawsonne Strong on 18 September 1833; and Susan Anne Symonds to William Stone on 4 August 1835. According to his biography in Alexander Gibson’s book on the Radcliffe Infirmary, Frederick himself wanted to be a sailor; but instead his father took him on as an apprentice surgeon. After serving as assistant to the apothecary at the Radcliffe Infirmary, Frederick entered University College Hospital. He then took a voyage to the East as a ship’s surgeon, returning to Oxford in 1833, when he started work as his father’s partner in place of his brother John. The 1841 census shows Frederick, described as a surgeon, living with his parents John and Mary Symonds at Beaumont Street. His sister Mrs Mary Nash was paying a visit with her daughter Ellen (3). Frederick was matriculated at the University of Oxford as a privileged person with the trade of “Chirurgeon” (surgeon) at the age of 30 on 22 March 1843. Soon after this he took over his father’s practice, and his father moved to Clifton near Bristol. The 1851 census shows John Symonds (71), described as a retired surgeon, and his wife Mary (75) living with their daughter Mary and her husband James Nash, the curate of Clifton, at Copington Villa, Richmond Park, Clifton. Ann Harrison Symonds (born at Beaumont Street on 9 December 1852 and baptised at St Mary Magdalen Church on 26 January 1853). On 6 August 1849 the wife of the Revd Alfred Radford Symonds of Madras (Frederick’s brother) gave birth to a son at Frederick’s home in Beaumont Street. At the time of the 1851 census Frederick and Anne were living at Beaumont Street with their daughter Rosamund (2) and son Horatio (11 months). Also living with them were their niece Fanny Cuming (6), who had been born in Canada; Ann’s unmarried sister Georgiana Dewar (26); and Frederick’s assistant John W. Harper. The family had four servants (a cook, housemaid, and two general servants). Frederick Symonds was admitted as a Fellow of the Royal College of Surgeons in 1852, and served as Surgeon at the Radcliffe Infirmary from 1853 to 1878. In 1854 he nearly died of cholera during the Oxford epidemic. On 21 August 1854 Frederick’s father John died at Clifton, Bristol at the age of 75. He was described in his death notice in Jackson’s Oxford Journal as having been surgeon to the Oxford Medical Dispensary and Lying-in Charity for 38 years. By the time of the 1861 census, Frederick’s family was complete, and he and his wife were home with Rosamund (12), Horatio (10), Mary (9), and Ann (8). The assistant surgeon living with them was now George Taunton, and they had six servants (a cook, butler, footman, nurse, housemaid, and general maid). Frederick’s only son Horatio was sent to Rugby School, and on returning to Oxford in 1867 was apprenticed to the surgeon Alfred Winkfield. On 16 June 1870 Frederick Symonds was created MA from Magdalen College. In the early 1870s he had “by far the largest and most important practice in the County, University and City of Oxford” (Dr Palmer). George Taunton was still Frederick Symonds’s assistant in 1871. Of Frederick's four children, only Horatio (20), who was now a student at University College, was at home. On 21 April 1875 at St Mary Magdalen Church, Oxford, Margaret Rosamond Symonds married Edward Lyon Fellowes, a Clerk in Holy Orders of Cumnor. In 1878 Frederick's son Horatio qualified as MRCS Edinburgh and returned to Oxford to enter practice with his father. Frederick Symonds retired from his post as Surgeon to the Radcliffe Infirmary and was succeeded by his son on 5 June 1878. † Frederick Symonds died at 35 Beaumont Street at the age of 68 on 11 September 1881 and was buried at St Sepulchre’s Cemetery on 15 September (burial recorded in the parish register of St Michael’s Church). His personal estate came to £59,551. DEATH OF MR. F. SYMONDS. — We regret to announce the death of Mr. Frederick Symonds, F.R.C.S., who expired at his residence, 35, Beaumont-street, on Sunday evening last, after a lengthened and painful illness. Mr. Symonds came of a medical family, his father, Mr. John Symonds, being a well-known practitioner in his day at Oxford, whilst his brother was the celebrated Dr. Symonds, of Clifton. He was born in 1813, and was educated at Christ’s Hospital and at University College London. He began practice in Oxford in 1833, and served the Radcliffe Infirmary for more than 25 years as surgeon. On his retirement in 1878 from that office the Governors in a special resolution recorded “their grateful recognition of Mr. Symonds’s long and valuable services to the poor at this Hospital,” and unanimously elected him an honorary surgeon and honorary life governor of the Institution. He rendered invaluable assistance to the sufferers from the Shipton railway accident in 1877, most of whom were brought to the Radcliffe Infirmary and experienced the benefits of his skill and care. In recognition of this he was afterwards presented with a handsome piece of plate by the Great Western Railway directors. In 1869 he was elected Coroner to the University, and in the following year the University conferred upon him the honorary degree of M.A., when he became a member of Magdalen College. He was also for several years surgeon to the University Volunteer Rifle Corps, but resigned a few years since. He was a Fellow of the Royal College of Surgeons, and a member of the Geographical, Microscopical, and other scientific societies. Mr. Symonds was highly esteemed, both in his private and professional capacity, and his many popular qualities endeared him to a large circle of friends, by whom he will be much missed. He had a high reputation as a surgical operator, and his practice, in the University and County especially, was a very extensive one until ill-health compelled his retirement from it some time back. His death will be sincerely regretted by many generations of members of the University who have received the benefit of his professional ability and experience. The funeral took place on Thursday afternoon, the remains being interred in St. Sepulchre’s Cemetery, Jericho. The cortege, which left the deceased’s residence shortly before three o’clock, consisted of a funeral car on which the coffin was deposited, drawn by the deceased’s own horses, and three private carriages containing the mourners. In the first were Horatio P. Symonds, Esq., and Professor Green; in the second, – Boyd, Esq., – Galloway, Esq., and the Rev. E. L. Fellowes; and in the third G. Taunton, Esq., and D. Bennett, Esq., of Faringdon. There was a very large assemblage both of members of the University and citizens, and others, in the Cemetery, and included among them were:— A. W. Hall, Esq., Col. Hall, W. W. Slade Baker, Esq. (Abingdon), Dr. Jackson, R. W. Raper, Esq., Trinity College, Dr. Darbishire, Rev. Dr. Percival, Rev. G. W. Kitchin, Rev. G. S. War, R. Horton, Esq., T. Tyrwhitt Drake, Esq., Dr. Markby, Rev. W. W. Merry, Rev. St. J. Tyrwhitt, Dr. Gray, J. Briscoe, Esq., T. Hawkins, Esq., Captain Owen and two sons, W. Ward, Esq., the Rev. Bartholomew Price, the Rev. Professor Legge, Chas. Symonds, Esq., Rev. C. N. Robarts, Dr. Corfe, Rev. — Logan, Rev. J. R. King and Mrs. King, J. O. Sankey, Esq., H. P. Mallam, Esq., Miss Davison, Dr. Ward, W. L. Morgan, Esq., &c. The Service was read by the Rev. D. P. Chase, D.D., and the Rev. H. A. Harvey, Vicar of St Mary Magdalen. The coffin, which was covered by a rich violet pall, was of polished oak, with gothic brass fittings, and bore the following inscription:— “Frederick Symonds, R.R.S., and M.A., born April 12, 1813, died Sept. 11, 1881.” An unusually large number of very beautiful wreaths were placed upon the coffin; among those who contributed them being Lord Norreys, the Hon. Mr. and Mrs. Percy Barrington, Mrs. Max Muller, Mrs. Leighton, Mrs. Clifton, Mrs. Percival, and many others, and the vault, a newly-constructed one, was also profusely decorated with flowers. The funeral arrangements were conducted by Messrs. Elliston, Cavell, and Son, of Magdalen Street. Normally the burial would have taken place in the St Giles's section of the cemetery, but the dwindling parish of St Michael appears to have been recycling prominent plots near the entrance to the cemetery in this period. The following year (1882) Thomas Hill Green, the husband of Charlotte Byron Symonds (who was the daughter of his brother John Addington Symonds) was buried in the other half of this double plot, which has continuous kerbs where his wife's uncle, the surgeon Frederick Symonds (brother of John Addington Symonds) had been buried the previous year. At the time of the 1891 census Frederick’s widow Mrs Anne Symonds was living at 35 Beaumont Street with her son Horatio (40), who was continuing to practise as a surgeon at the house, and her daughter Mary (39), both of whom were as yet unmarried. In 1898/9 (reg. first quarter of 1899) at St George’s Church, Hanover Square, Mary Georgina Symonds (47) married John Percival, Bishop of Hereford, whose first wife had died in 1896. Percival had previously been Headmaster of Clifton College from 1862 to 1879, President of Trinity College, Oxford from 1879 to 1887, and Headmaster of Rugby School from 1887 to 1895. 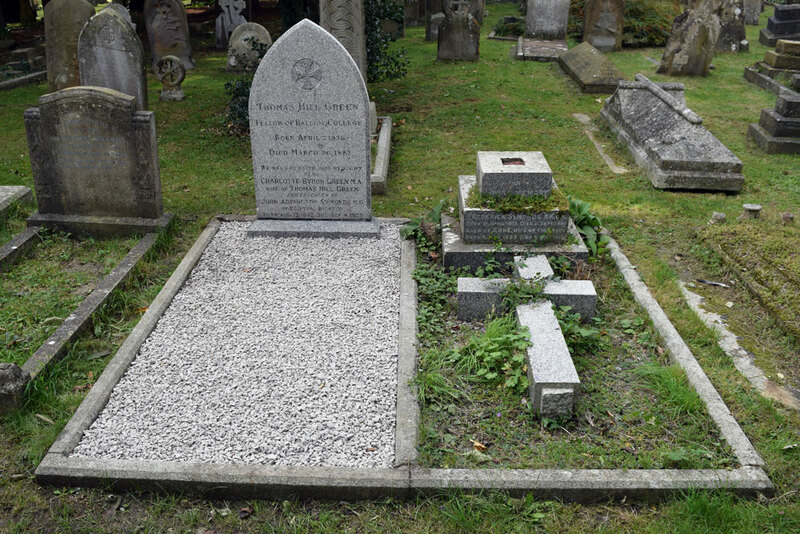 † Mrs Anne Symonds née Dewar died at 6 South Parks Road at the age of 87 on 4 July 1910 and was buried at St Sepulchre’s Cemetery on 7 July (burial recorded in the parish register of St Michael’s Church). The floral tributes at her funeral were pictured in the Oxford Journal Illustrated of 13 July 1910. Her effects came to £1,784 8s. 5d., and her executors were the Provost of The Queen's College and the Rector of Exeter College. †Mrs Mary Georgina Percival, née Symonds died at 64 Banbury Road at the age of 74 on 1 May 1926 and was buried at St Sepulchre’s Cemetery (burial probably recorded in the parish register of St Michael’s Church, later burials not transcribed). Her effects came to £19,349 9s. 10d., and her executor was her sister Anne. Her sister Anne Harrison Symonds never married. At the time of the 1911 census she was living on her own with three servants at 51 Banbury Road, and her sister Mary (Mrs Percival) was paying a visit. 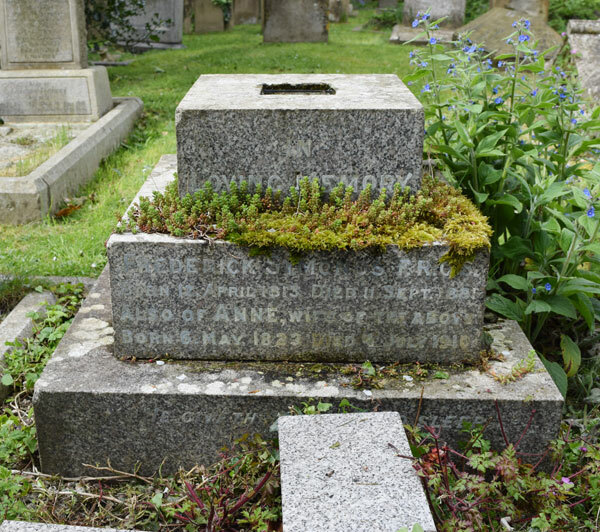 † Miss Anne Harrison Symonds died at 64 Banbury Road at the age of 85 on 28 April 1938 and was buried at St Sepulchre’s Cemetery (burial probably recorded in the parish register of St Michael’s Church, later burials not transcribed). Mrs Margaret Rosamund Fellowes, née Symonds (born 1849) and her husband the Revd Edward Lyon Fellowes, Rector of Wimpole, were living at the Rectory in Wimpole, Cambridgeshire in 1851 with their children Thomas Lyon Fellowes (born at Cumnor in 1876) and Rosamond Sophie Fellowes (born at Oxford in 1878), and four servants. Their next daughter Constance Gwendoline Fellowes was born in Oxford in 1881. On 23 July 1896 her husband died at the age of 51 at Wimpole Rectory, Royston, Cambridgeshire, and his effects came to £1,262. At the time of the 1901 census Margaret was living at 2 Queen Anne Terrace, Cambridge with her two daughters and two servants. She died at 9 Park Terrace, Cambridge on 9 June 1923, and her effects came to £1,562. Horatio Percy Symonds (born 1850) continued to practise as a physician at 35 Beaumont Street after his father’s death. In 1882 his cousin’s husband, Thomas Hill Green, died in his house. He was one of the first people in Oxford to get a telephone: in 1895 his number was simply 10. On 15 December 1892 at St Jude’s, South Kensington he married Marion Robison Leckie, daughter of Patrick Comrie Leckie, and a long report on the wedding appeared in Jackson’s Oxford Journal of 24 December. They had two sons, both baptised at St Mary Magdalen Church: Ralph Frederick Symonds (born on 17 August 1894 and baptised on 8 September 1894) and Anthony Dewar Symonds (born on 31 May 1896 and baptised on 1 July). Anthony died before his first birthday near the beginning of 1897. At the time of the 1901 census Horatio and Marion and their son Ralph were living at 35 Beaumont Street. They had six servants: a cook, nurse, footman, kitchenmaid, and two housemaids. By 1911 they had moved to 35 Banbury Road, and their son Ralph was boarding at Radley College. Horatio resigned as surgeon of the Radcliffe Infirmary in 1915 and retired. He died at 35 Banbury Road on 16 January 1923, and his effects came to £14,552. His widow was living at 1 Bradmore Road in 1936, and died in Oxford in 1952 at the age of 89. Their son Ralph, who became a Lieutenant Colonel in the army, died in Oxford in 1971.